Singapore's (4 million inh.) rapid transit system is considered one of the most modern in the world and was the first one to introduce platform sliding doors to protect passengers from falling onto tracks and to allow better air regulation in underground station areas (similar doors were installed in the St. Petersburg metro from the 1960's though). 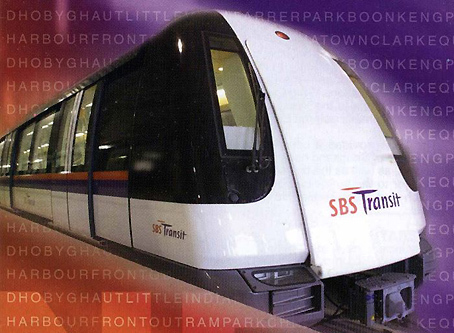 The system (MRT and LRT) is operated by two companies, SMRT and SBS Transit. 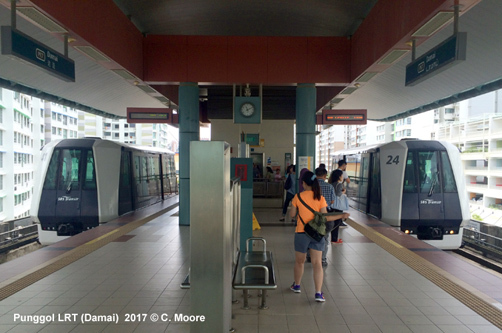 Lines are named and stations can also be identified by a line/station code, like Jurong East would be NS1 and EW24. 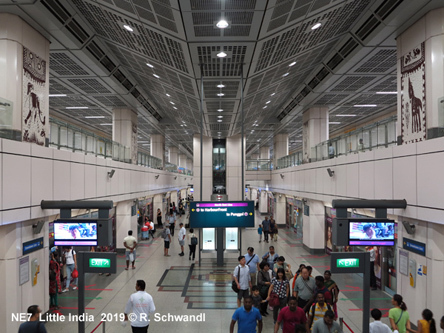 Unlike other metro systems, Singapore uses destination codes, instead of line numbers. 2002: 2 lines, 89.4 km (23.3km underground), 51 stations (16 underground, 9 of which are prepared as civil defence stations), including 6.4 km airport branch. 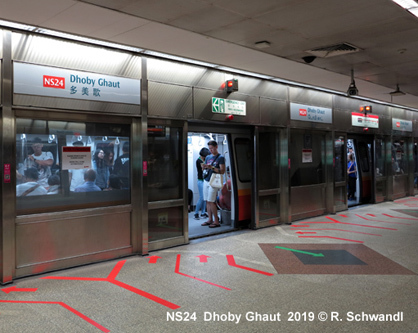 Average station depth is 14.7m, Raffles Place being the deepest on these two lines at 21.3m. 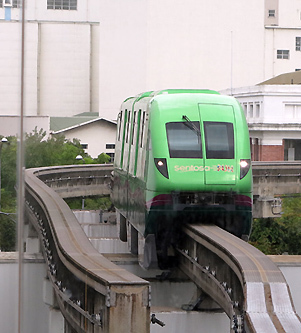 EWL & NSL are served by 138m long 6-car-trains, which are air-conditioned, with 4 doors each car. Carriages are 3.2m wide. Trains reach a maximum speed of 80km/h (average 45km/h), now normally operated under CBTC control; they use 1435 mm gauge, power supply is via third rail at 750V. 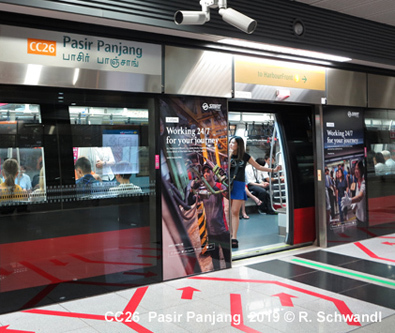 A 20 km underground and fully automated*, driverless line from the HarbourFront (World Trade Center) to Punggol opened in June 2003; operated by SBS. Woodleigh station only opened in 2011 once the area got fully developed. The first 25 six-car trains were delivered by Alstom in Oct. 2000. 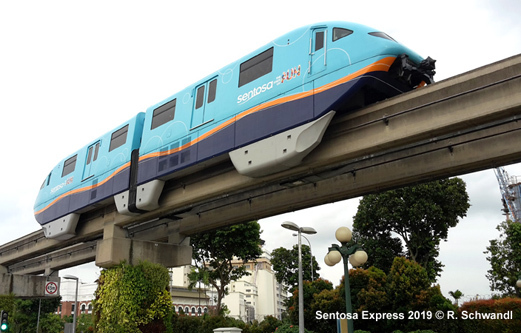 They are able to travel at a maximum speed of 90km/h and are powered via overhead pantographs. 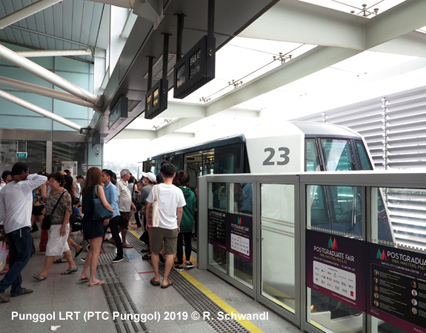 This line (total travelling time 33 minutes) is operated by SBS Transit. 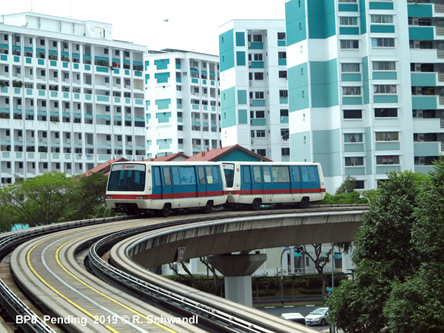 They also operate two LRT feeder lines, the Sengkang LRT & the Punggol LRT (see below). 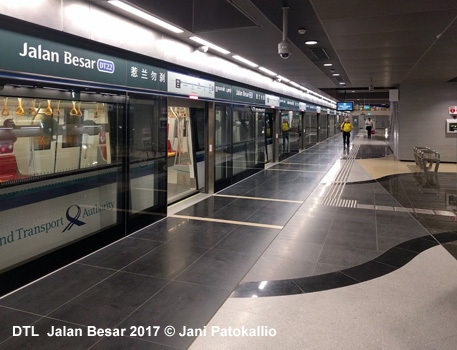 The first 5.7 km section of a 33 km circular line (although not really a full circle) opened in May 2009 between Bartley and Marymount, intersecting with the North South Line at Bishan, and the North East Line at Serangoon. 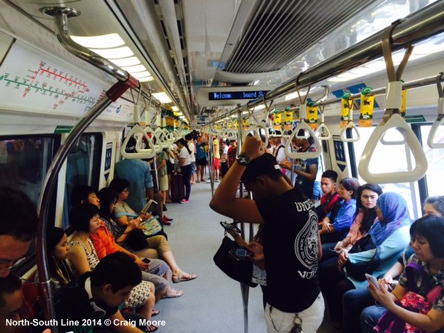 Like the North East Line, the Circle Line is a driverless metro, but operated only with three-car trains by SMRT. 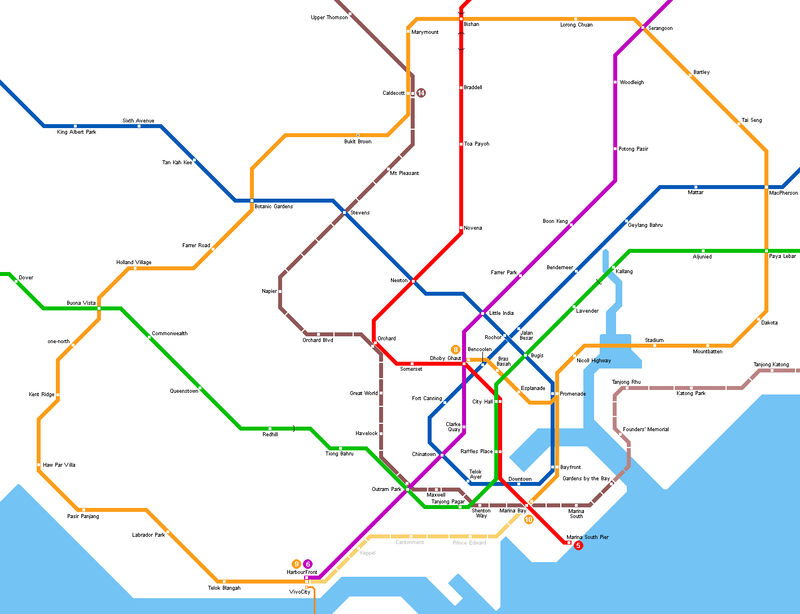 A 2.4 km branch to Marina Bay (with stations numbered CE1 for Bayfront and CE2 for Marina Bay) was added in early 2012. 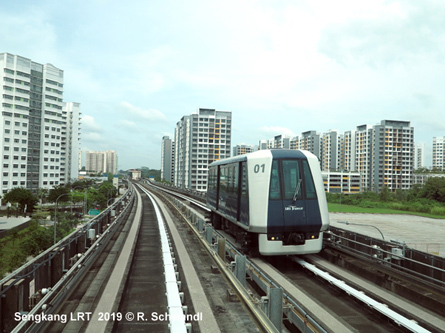 Acting as a feeder line to the North South Line, and since Dec 2015 also to the Downtown Line, this automated elevated people mover line started operation in 1999, connecting the MRT station at Choa-Chu-Kang with the new town of Bukit Panjang. 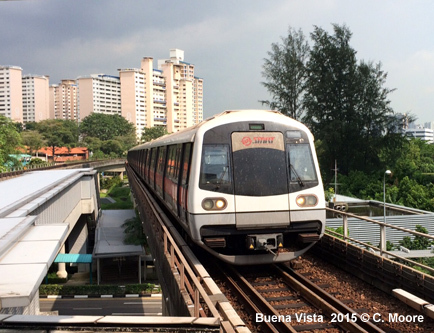 Service is provided on a double track loop line every 6 minutes (2-4 minutes during rush hours) from 5:00 to 1:00. 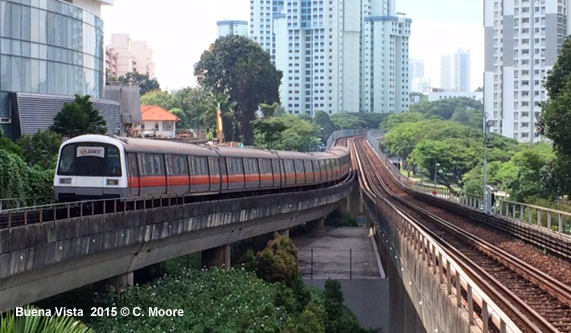 The 7.8 km long line with 14 stations is operated by SMRT, and uses 19 rubber tyred vehicles. BP1 Choa Chu Kang, BP2 South View, BP3 Keat Hong, BP4 Teck Whye, BP5 Phoenix, BP6 Bukit Panjang, BP7 Petir, BP8 Pending, BP9 Bangkit, BP10 Fajar, BP11 Segar, BP12 Jelapang, BP13 Senja. 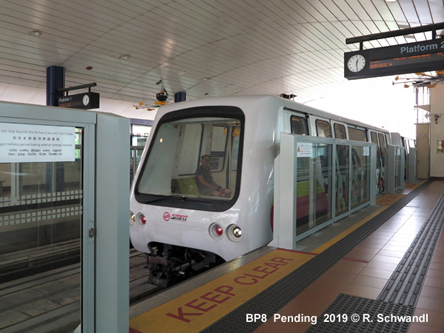 This is an 8-shaped fully automated mini-metro designed as a feeder line for the North-East-Line, operating a 3.5 minute headway during peak hours and a 6-minute off-peak service; operated by SBS. 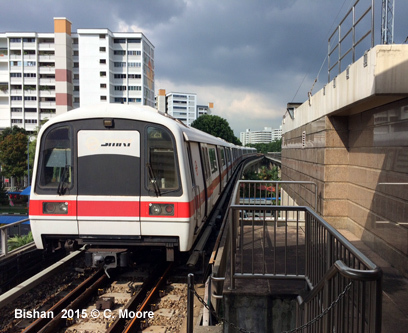 This is the second automatic people mover working as a feeder line for the North East Line; operated by SBS. 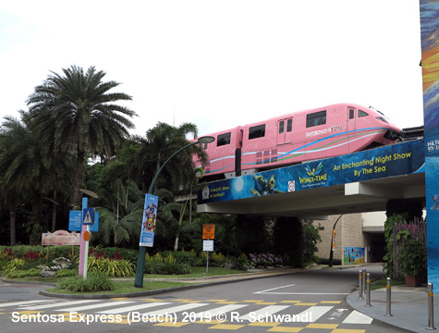 Since 15 Jan 2007, the 3-station Sentosa Express (monorail) has linked the Sentosa island to the mainland, where it provides transfer to the MRT at the HarbourFront station. A fourth station, Waterfront, was added on 1 Feb 2010. 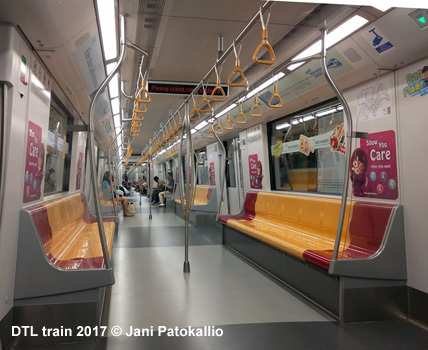 Cross Island Line (CRL) - initial section running from the area east of Changi Airport via Pasir Ris (EWL), Hougang (NEL) and Ang Mo Kio (NSL) to Bright Hill (TEL). BLOG: Read your webmaster's impressions after a visit in January 2019 ! Visit our line-by-line photo gallery! 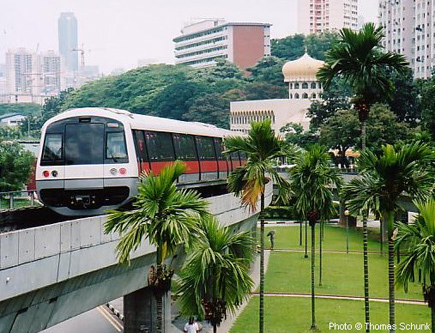 The integration of land use and transport planning. 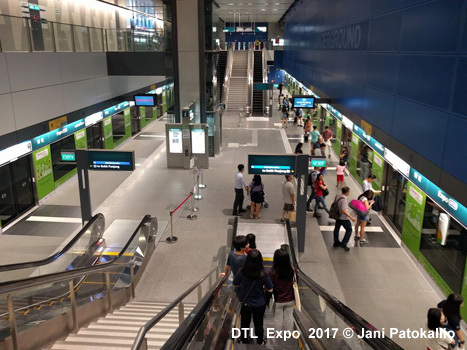 The LTA has intensified land use across the island by decentralising commercial activities along rail corridors, integrating MRT stations into commercial facilities, and creating transport hubs which act as a focus of housing developments. 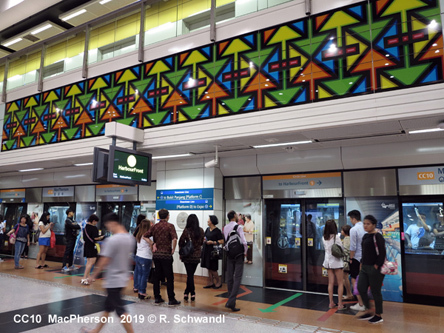 Intensifying development around main MRT stations reduces the need for travel and increases the utilisation of the MRT, enabling the rail network to develop routes that serve the most densely populated areas and corridors, linking the population to the main commercial, business and industrial areas and trip generating points. Network integration. 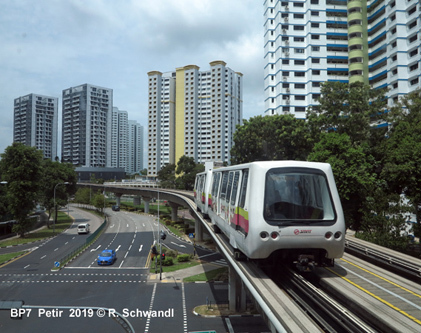 The MRT is the backbone of the transport system in Singapore and has a hierarchical role, with LRT and bus services planned around MRT services. 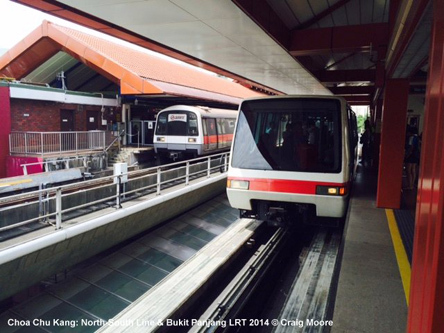 MRT and LRT stations are physically integrated to main bus stations which provide feeder routes. These routes are planned so that the duplication of services is limited and there is improved utilisation of transport resources and more effective coverage. The co-ordination of services also involves timetable integration, an integrated fare system (EZ-link card- distance-based contactless smart card), and integrated travel information via an impressive GPS/RTI electronic travel guide with full journey planning and fare information, or hard copy information (TransitLink guide). All this is achieved despite different ownership. Standard integration. Service standards and performance are set and rigourously monitored by the LTA and the quality of provision is an essential ingredient. 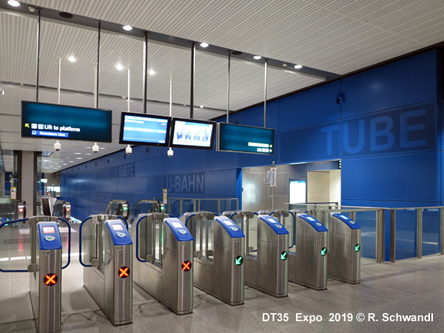 Supplementary provision such as pedestrian linkways to housing and adjacent commercial buildings, cycling and taxi facilities, intermediate and end-point commercial amenities, customer service centres, uniform station information and wayfinding, and safety (barriers/CCTV etc.) are all at forefront of design, construction and operation. Capturing performance is made easier because the government has managed transport competition. 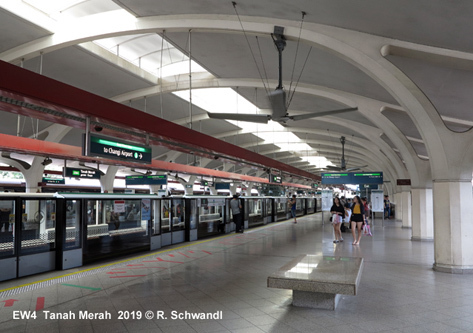 Essentially, two multi-modal operators exist – SMRT, which mainly operates trains and a small bus network and one LRT; whilst SBS mainly operates buses as well as two light metro lines and accompanying LRT lines. This structure provides the benefits of competition in terms of peer benchmarking in service standards and cost efficiencies, but enables easier service and policy integration. This approach provides the population with high quality mobility options and a spectrum of seamless transport choices to accommodate varying travel needs. The harmonisation of services, brand and information makes travel by public transport efficient and effective. 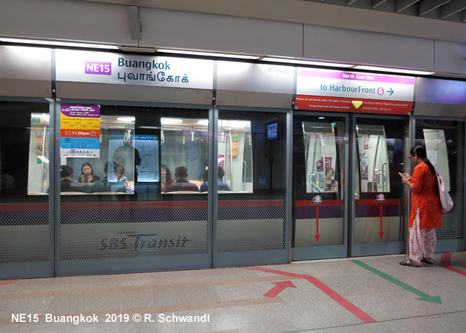 Whilst this approach is common in Europe, it is not the case in Asia, where mobility is often based on sheer volume than any planning protocols. 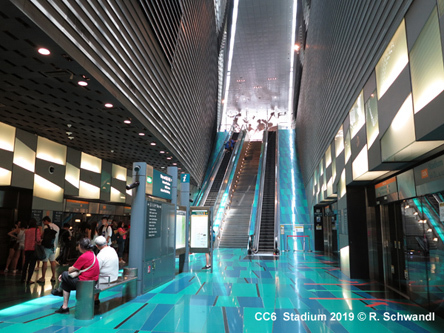 This makes the Singapore experience all the more impressive and successful, supported in many ways by a dominant government and relatively obedient population. Download full report (PDF)! Or read your webmaster's comments after a visit in January 2019 in my blog!